Not everyone who works with an industrial ammonia refrigeration system understands everything about how these systems work. However, it is important for people in the food processing, beverage processing, and frozen food industries to know at least a little about refrigeration. Keeping your work force up-to-date on the refrigeration system they use can help you better communicate with employees, and get a better understanding of your business needs. Here are some basics on how industrial refrigeration systems function. Some people believe cooling systems create cold air, but this is not technically the case. In order to experience cold, you have to remove the heat from something, and this is the basic principle behind all refrigeration systems. When a liquid evaporates, it removes heat with the vapor. To demonstrate, wet your hands and hold them in front of an electric fan. The evaporating water is what takes the heat from your hands, and they feel cool. A typical refrigeration system (including an industrial ammonia refrigeration system) uses a liquid refrigerant to transfer heat from inside the space to outside the space. A compressor pumps the refrigerant through evaporation coils, and condenser coils. Refrigerant becomes a gas (absorbs heat) in the evaporator and returns to liquid in the condenser unit, where it loses its heat. In fact, a condenser fan blows heat from the condenser coils. This is why it is warm when you stand behind an outdoor AC unit. An industrial ammonia refrigeration system is used for large-scale operations. Ammonia is a very-efficient refrigerant, and one of the most cost-effective refrigerants for commercial use. It is not used in modern home refrigeration, anymore, because its fumes can be toxic. Businesses use ammonia refrigerant systems because they can save a lot of money on energy. Also, detecting leaks in an industrial setting is easy, because it has distinct of the odor. Ammonia is a good choice for eco-friendly businesses because it does not damage the ozone. 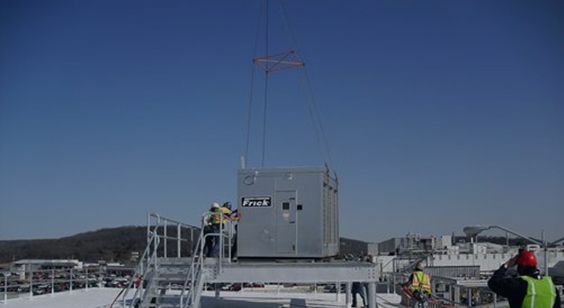 Whether you need to install an Industrial ammonia refrigeration system, or if you need to schedule an inspection, or have maintenance conducted on an existing system, McNeil has you covered. We have decades of experience designing, and maintaining, commercial refrigeration systems. To learn more, contact us today!